There seems to be a standard philosophy that exposed wood is good and any form of natural wood trim in a room is always preferable to none. However, the fact is we often see poorly planned and applied finish carpentry, which makes the space look worse than if it weren’t there at all. A skimpy crown molding will appear cheap and a thin or poorly placed chair rail will make the room feel awkward. But is it necessary to rip them out and start over? David West, owner of Meadowview Construction in Ipswich, MA, offers some great ideas on sprucing up and pumping up miserly moldings without breaking the bank. Use the following tips yourself or hire a professional carpenter to spruce up your moldings for you. West suggests this same technique can be used to great effect on chair rail moldings as well. While it may be common to see simple Colonial casing used horizontally around a dining room, this is often too small a profile, causing a feeling of cheapness. West simply raises the height of the chair rail by adding back band molding onto the top of the existing molding, which results in a significantly more elegant and finished look. Additionally, this is a fairly easy and inexpensive upgrade. In areas with significant stock of older and antique homes, the moldings may have been lovely once, but have degraded or been painted so many times that they become eyesores. Many homeowners find the idea of painting wood to be somehow wrong, but design professionals opine that it’s not such a black and white issue. If the wood was poor quality to begin with, it likely should have been painted. Over time, even the best woods will discolor, depending on location and the standard of the original finishes. Strip the paint or skip it? When it comes to overpainted molding, West does not recommend going to the effort of stripping it down, unless the paint is cracked and peeling, possibly the result of an inexperienced painter using paint over a previously stained surface. The work involved is very labor intensive and dirty and best avoided if at all possible. 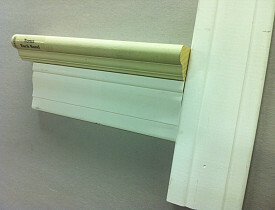 As with many home repair projects, ugly moldings can usually be spruced up with a little creativity and elbow grease.